AvL's 2.4m Premium SNG/MIL vehicle mount/transportable antenna system is WGS ready as it enables simultaneous X and Ka communications and is built to provide maximum operational flexibility to the tactical user. The antenna is also L, Ku and DBS capable. Field proven, the Model 2410’s integrated antenna/positioner/feed/ electronics hardware makes this MILSATCOM antenna true quick-deploy with operational status achieved in less than 15 minutes. The need to manually reconfigure the antenna to change bands or polarization is eliminated through the use of the simultaneous dual-band X/Ka feed. AvL’s premium SNG/MIL antennas are industry leading performers with top-caliber, lightweight materials and components. These antennas offer unique features such as ultra low-stow dimensions, high wind tolerances and numerous interchangeable feed options. The Premium SNG/MIL antenna family offers exceptional performance and ease of operation that’s ideally suited to military and SNG applications. These antennas are frequently used on military VIP vehicles, Special Operations vehicles and other military trucks and trailers. For the SNG market, these antennas are frequently used by networks and they’re a favorite of international media for sporting event coverage. 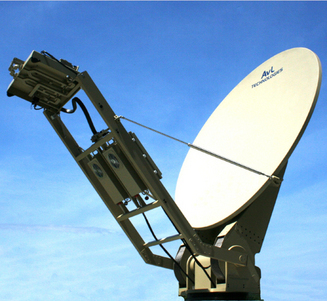 The Premium SNG/MIL antennas are designed to meet and exceed the highest performance requirements around the world to guarantee both satellite authority compliance and peak in performance, reliability and availability. Typically these antennas are used in signal contribution for high data rate and bandwidth as well as high power broadcast or similar applications.